Jerry McBride/Durango Herald - Hanging out at the 11th Street Station, from left, Matt Leach, Sarah Trask with her dog Kenosha, left, Harrison Hopkins, an Jack Burk with his dog Ziggy. You say Durango has gone to the dogs? That’s certainly not news. Stroll downtown or hike a local trail, and you will encounter dogs on nearly every block and at every bend of the path. Even on an afternoon float on the Animas River, you’ll see a pooch or two, and not just splashing near shore or romping full speed in the dog park. A recent visit to the Whitewater Park at Santa Rita revealed an owner and his tail-wagging friend sharing a paddleboard in the pool below Corner Pocket. It was quite the balancing act. So is the decision restaurant owners must make if they are thinking about opening up their outdoor patio areas to dogs (other than service dogs). It is not as simple as putting up a “dogs welcome” sign, and we are glad for that. Restaurateurs need to apply for a variance from San Juan Basin Public Health, explain the need for it, describe the steps they will take and training they will provide to employees to ensure health and safety, and then wait for Colorado Department of Public Health to approve or deny the application. Because the process can take several months, owners must decide if providing a dining-with-dogs option is worth it. For some eateries, like Cyprus Café and Homeslice Pizza, it certainly seems to be. 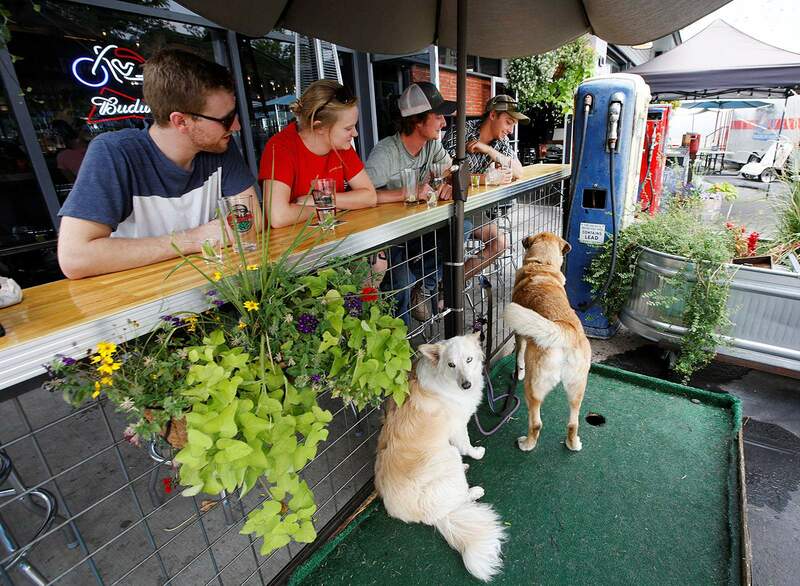 Business from dog-owning diners – both local and from out of town – is booming, and we expect the number of Durango restaurants with patios open to dogs will grow. In a town with so many restaurant options, there will always be plenty of places for people to go where there won’t be a dog in sight. While dog-friendly patio dining depends on decisions by restaurant owners and public health officials, it depends even more on dog owners and their well-trained and well-behaved companions. A dog fight, or worse, a dog bite, can have repercussions beyond a ruined outdoor dining experience. We thank all the dog owners who have put in the time to train their dogs well, who keep them leashed, and who clean up after them in town and on the trail.